2. Let's Get it Started! This tutorial was tested on Joomla version 1.5.12, installed with all sample data. For our example, the first thing we will do is to create a section and a category for our RSS Feed. This category will hold all our news articles. 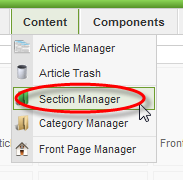 Now go to your Joomla administration back-end and click on the "Section Manager" from the "Content" menu. Then on the upper right corner of the screen click on "New" to create a new section. Then you see the page where you can enter the details of the new section. Here enter a title for the section, in our example "MyNews". Here enter an alias for the section, in our example "my-news". Don't forget to publish the section. Last click on "Save" to continue with the next step. 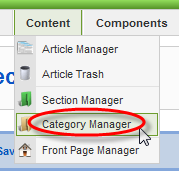 Now click on the "Category Manager" from the "Content" menu. Then on the upper right corner of the screen click on "New" to create a new category. Now you see the page where you can enter the details of the new category. Here enter a title for the category, in our example "News Feed". Here enter an alias for the category, in our example "news-feed". 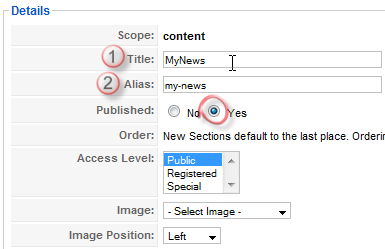 Choose the right section for the category, which is the section you created before; in our example "MyNews". Don't forget to publish the category. 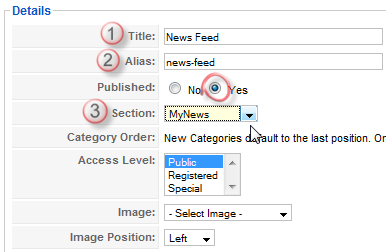 Last but not least publish any of your news articles and assign them to section/category you have just created.